Pinkpackrat@Play: An App for That? Not since the days of the six hole outhouse has doing number two been so chummy-- call me old fashioned, but there are some things I just don't want to know about and one of them is how big your poops are-- that is unless you are under two years old and just learning how not to do it in your diaper. I mean why would I care how many people are taking a dump when I am or want to see in a map view on my iPhone? The iPoo makes me want to go back to Victorian times when men and horses sweated and ladies " glowed" and when nobody talked about personal bodily functions-- but there is no accounting for taste and lots of people seem to want company even on the toilet these days. 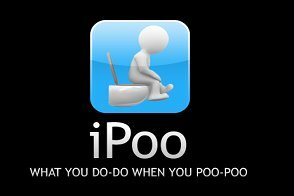 Go ahead, download the iPoo app and delight yourself and your friends. I won't be joining you on the john, thanks anyway. Call me a prude, but I'll pass on this one. That has to be the "number two" worst app. There's a reason I don't own a cell, only borrow one with NO apps other than "send" and "end" for road trips, and keep a book or two in the loo to pass the time while I'm doing my business! It sounds like a portion of society has never matured from their potty fascination as toddlers.